Can We Overcome Racial Bias? 'Biased' Author Jennifer Eberhardt Says To Start By Acknowledging It In her new book, psychology professor Jennifer Eberhardt explores how unconscious racial bias shapes human behavior — and suggests that we examine what situations can trigger racial bias. Now, as an adult, Eberhardt says she realizes that in the majority-white suburb of Beachwood, she was experiencing a phenomenon known as the "cross-race effect" (or "other-race effect") — that's the tendency for people across all races to be better at recognizing faces of their own race than people of other races. This effect can be seen in the part of the brain involved with recognizing faces — scientists call it the fusiform face area. While the phenomenon was merely confusing for Eberhardt as a child, she said it could lead to harmful, racist behavior. "It's like a precursor for bias, basically, because if your brain isn't processing those faces, you're not able to individuate the faces. You're thinking about those faces in terms of their category," she explained. "Once you put a face in a category then that can also trigger your beliefs and feelings about the people who are in that category. And then that can lead you to treat them differently." So how do we get rid of that inherent bias in our brains? 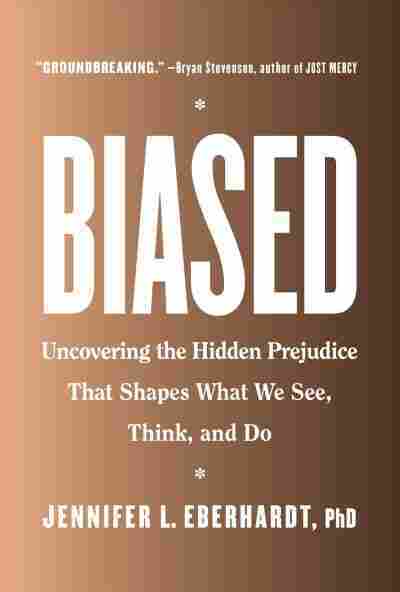 In Biased: Uncovering the Hidden Prejudice That Shapes What We See, Think, and Do, Eberhardt writes about her decades of experience studying race and our everyday interactions — and suggests that in order to overcome our own racial biases, we must acknowledge them. Racial conditioning in our brains starts young, according to Eberhardt. At three months of age, she said, babies start to show a preference for faces of their own race. Eberhardt recounts being on a flight with her son when he was 5 years old: He suddenly pointed at the only other black man on the plane and told his mother that the man "looked like daddy." After that comment, Eberhardt said she was prepared to talk to her son, who is black, about how not all black people look alike. Then, she writes in her book, her son looked up and added, "I hope he doesn't rob the plane." "We're living with such severe racial stratification that even a 5-year-old can tell us what's supposed to happen next," Eberhardt said. However, Eberhardt noted that kids who grow up in interracial homes don't show as much evidence of the cross-race effect. To her, that suggests that the environment around us affects our racial conditioning. And not only that, but Eberhardt also argues that the situation or environment around us can affect when our racial biases come into play. NPR spoke with Eberhardt about her argument that the key to overcoming racial biases may lie in avoiding situations that trigger them. I think it's important to try to strip it from, you know, the moral associations that we have with it, because I think one of the big points in the book is that you don't have to be a white-robed racist to be biased. You don't have to be a bad person. We have these bias trainings happening all over the country... and so many of these trainings, they're well-intentioned, but they haven't been rigorously evaluated, so we don't know as much as we might and then on top of that, the trainings that are out there can vary quite a bit on content and how they are structured and so forth. So, we don't know as much as we should. But there is some evidence that the trainings that focus not only on what bias is, but how to manage bias work better than others. Bias is not a trait but a state. So, some situations make us more vulnerable to bias than others. And the more we understand this, the more powerful we are because then the issue is trying to figure out — what are the situations where bias is more likely to come up? — and to figure out how to avoid those situations, or how to brace yourself, or how to slow down in those situations. So in situations where we feel threatened or fearful, we are more likely to act on our biases than in situations where we are feeling affirmed. They decided to change their foot-pursuit policies. Instead of chasing someone into a sort of a dark backyard or into a place where you couldn't see where they were and you know it was hard to get out — they were told not to do that — instead, to step back and set up a perimeter and call for backup. Before they changed the foot-pursuit policy, you're placing officers in a situation where bias is more likely to take hold and to affect their decision-making, and you're putting them instead in a situation where they can slow it down and think it through and have the resources available to them to deal with it, and so they are less likely to have bias affect what they do. We're kind of limited, you know, to the extent that we can actually rid ourselves of bias. I don't even know if that's a goal that is achievable. People always want to know how we can get over bias. And I understand that. But bias is not something we cure, it's something we manage. There's no magical moment where bias just ends and we never have to deal with it again. It's hard to teach people to be colorblind in a world that's not. Everything from birth emphasizes racial divides, from where we live to where we attend school, to where we work, how much money we make, to what ailments we face, to how we die. And race not only affects how we see people, it's affecting how we see places how we see things. It's affecting how we see institutions and policies — it's really shaping our vision of the world. So you can't just will yourself to see past it. And, in fact, when we try not to see color, we don't see discrimination, so ironically an attempt at color blindness can lead to more racial inequality, rather than less. Take a gamble — keep trying to connect and keep trying to work on this, because the minute we turn away, the worse it gets for everybody. Justine Kenin edited and Lauren Hodges produced this piece for radio. Amanda Morris produced it for digital.